We found out about Milan via social media. She had been confiscated by San Bernardino City animal control and was held as evidence in an animal cruelty case for neglect. 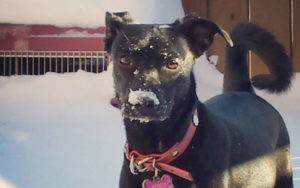 Since she was considered evidence, Milan could not be released from animal control until the court case was finalized. Due to the high volume of animals San Bernardino animal control intakes, Milan would have 24-48 hrs to safely exit the shelter system. We watched and waited patiently for three weeks, and finally, she could be released to a rescue group. Hearing about her loving personality, we knew she had to be the first official save of The Rescued Dog! When first meeting Milan, her state of malnourishment was very evident: only 39 lbs with ribs, vertebrae, and hip bones all protruding. However, her pleasant personality and eagerness to please people demonstrated that she was not mentally affected by her past mistreatment. 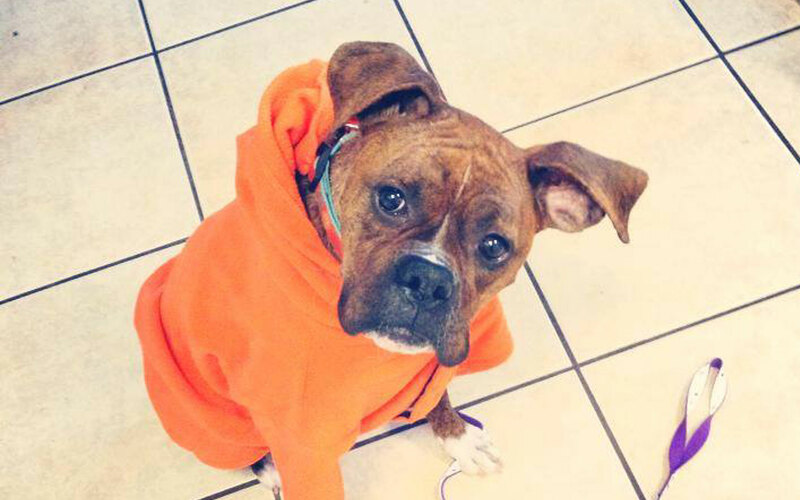 Her resilience is a testament to the true boxer breed. Milan has come with her fair share of medical ailments: malnourishment, thin fur, dry flaky skin, canine tooth missing, giardia, and yeast infections. Our vet believes that at only 1 year old, Milan had a litter of pups only a week or two prior to being confiscated by animal control. Sadly, her pups were nowhere to be found. Since becoming a Rescued Dog…. Milan has gained 6 lbs and is thoroughly enjoying three bowls of The Honest Kitchen each day. She enjoys the company of her canine foster siblings and enjoys playing with dogs both big and small. Milan is currently being house trained, learning basic obedience, and gaining confidence out in the world. 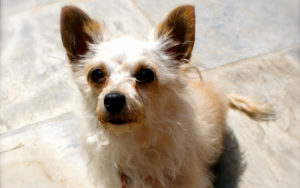 Milan will be ready for adoption in March and will make a great addition to any family! 7 FALL SAFETY TIPS FOR FIDO THIS SEASON! The Rescued Dog is a non-profit 501(c)3, all-breed dog rescue in San Diego, CA. We consist of a network of fosters and volunteers dedicated to rescuing and rehabilitating dogs in need throughout California and Mexico. We are committed to placing dogs in loving, forever homes and educating adopters on the responsibilities of dog ownership. The Rescued Dog strives to work with local area shelters and other rescue groups to create a better world for homeless pets. What brand and formula of food is your foster eating? Please be as specific as possible. Once a day, twice a day, morning and night, etc. One cup, 1/2 cup, etc. Daily walk, taken for a run 1-3 times per week, taken to off-leash dog park once a week, etc. How long is your foster left in his/her crate? Walks calmly, pulls occasionally, pulls constantly, seems reactive towards people or dogs when on leash, etc. Chewing on inappropriate items, not taking treats gently, potty training, crate training, etc. I got my start in dog rescue by using Facebook to help network dogs who were in high kill shelters in San Bernardino, CA. While that was fulfilling, I really wanted to be more hands-on and interact with the dogs who were being saved. I wanted to personally see the transformation from a scared shelter dog to a happy and adoptable dog. So far I have fostered four wonderful dogs for The Rescued Dog and hope to foster many more! I also love volunteering at the adoption events and watching when a match is made between a dog and their new owners. Life has so much to offer if we remember to look beyond ourselves. I volunteer because it continuously teaches me something new about people, about cooperation, about compassion, and about myself. I have a great passion for animals. We have three rescue dogs that came to us in 2008. Since then I’ve wanted to work with an origination that helps save dogs and put them in forever, loving homes so when I came across this opportunity with The Rescued Dog to help I jumped at the chance. I am passionate about their mission to save dogs from high kill shelters and I truly believe that help comes in many forms, volunteering is one way to accomplish what we are supposed to accomplish in this lifetime. I started volunteering with TRD in 2015. Volunteering has been great. I love dogs, I mean who doesn’t right?! However, I do not own a dog…not yet. I live vicariously through the rescue. If you can’t afford to adopt a dog or don’t have the ideal living situation to have a dog, like me, you can still “scratch your itch,” that’s a great thing about volunteering with us. So, the irony is I have been telling you about how great it would be to adopt a rescued dog and save them from their unfortunate circumstance and put them in a happy and caring home, and in my case, I didn’t know it then, however, the rescue saved me. I couldn’t have asked for a better group of people to be a part of and for filling my need to be around so many furry friends. I was introduced to rescue as a child when I met a greyhound rescue organization one night at Balboa Park and convinced my parents to adopt one. Our family greyhound Bookie and I were best buds for the ten years we had him. Since then I have been a sucker for rescue dogs. I am so glad I was introduced to TRD by a friend and fellow foster, and have had a chance to work with some great people and dogs, and found my little buddy, Madison! I was introduced to The Rescued Dog while working at a local shelter. I was excited about their mission to save dogs from high-kill shelters & wanted to participate with this mission. I love working with the TRD team and fosters to get these pups out of the shelter, into a great foster home and finally on to their furr-ever homes! I have always been a firm believer that doggie cuddles could save the world. So, when my mom said she wanted to start fostering dogs I was very excited. In the short period of time I have been volunteering with The Rescued Dog I realized I want to be an advocate for change. I took on this role not only to push myself but to also be a bigger voice for all of the shelter animals, since they can’t do that on their own. The bond I have with my dog, Otis who I rescued about 2 years ago, is that of a family member, a best friend, and a companion. Saving dogs from high kill shelters is a rewarding task, but adding a new member to someone’s family is life changing. Rescued is truly the best breed. I got involved with rescuing dogs when my own dogs and animal loving kids got a touch older and realized I had a tiny amount of free time to fill! My kids begged for Chihuahuas, Daschunds, Huskys etc….so naturally I thought fostering would be great! Once I got in, I was hooked and wanted to do more to help shelter dogs find the forever love my own dogs had. In regard to volunteering, I believe that if we all give a little we can accomplish a lot! 10 years ago I took a road trip from Philadelphia to San Diego with my beloved English Bulldog. As a travel nurse, I was given the opportunity to move across the country, and with working only three days a week, I had time to volunteer with my first passion, rescue dogs. Through volunteering, I met an amazing group of women who shared my same vision, so we collaborated The Rescue Dog! I am so proud of our accomplishments and I look forward to continuing to educate and save lives! I was fostering for the SD Humane Society but was looking for a rescue I could become more involved in. A friend foster failed with TRD so I filled out an application. I feel like I’ve found my calling! There is nothing like getting a dog right out of the shelter and making him feel safe. Now as an adoption coordinator I get to see the rescue through to the end, a great family and a forever home!! I rescued my first dog in 2010 and started volunteering with a rescue a year later and loved it! After meeting a few amazing friends, it became evident rescue work was more than just a fun hobby. I truly believe the best dogs are rescued dogs and have come to find my true passion in life is in dog rescue. Fostering is one of the most rewarding experiences one can have and I highly recommend it to everyone! I can’t imagine my life without dogs, and thankfully I’ll never have to. I’m so excited to be working with such a fantastic group of people and I can’t wait to see what The Rescued Dog accomplishes! It is easy to buy a dog from pet stores, online ads, or from dog breeders, but rescuing a shelter dog is definitely more rewarding. How can you not admire that once sad dog, now all waggy and happy because they’ve been given a second, sometimes third chance at finding their forever home? The ability of these pups to recognize and embrace their new life never ceases to amaze me. The Rescued Dog saves dogs from high kill shelters and prepares them to meet and be adopted by a loving family. TRD fills the corners of my life and it makes me happy to know I’m doing something worthwhile for these sweet pups. Having rescued – and been rescued – by my own dogs proves that rescued really is the best breed. My passion for rescuing dogs comes from my great experiences with rescue dogs in my life. I personally have had my life brightened by many great rescue dogs, and I have seen how having pets, and dogs particularly, has improved the lives of my friends and family. For me, the best part of dog rescue is seeing the connection that dogs and people make, and knowing that when we connect the right dogs with the right people, we are improving the lives of everyone involved, both human and canine.